Putative single-copy genes and conserved ortholog sets (COS) were identified in model plant species thale cress (Arabidopsis thaliana), rice (Oryza sativa ssp. japonica), and poplar [black cottonwood, Populus trichocarpa (Torr. & Gray ex Brayshaw)] and used to find putative COS in four conifers (the Coniferales order). 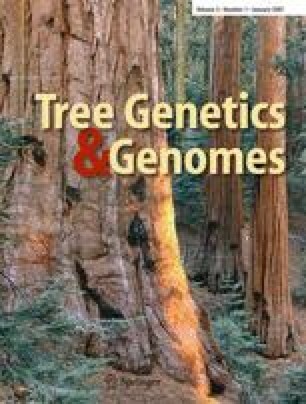 Using expressed sequence tag sequences, unique transcript sets were assembled in loblolly pine (Pinus taeda L.), white spruce [Picea glauca (Moench) Voss], Douglas-fir [Pseudotsuga menziesii (Mirb.) Franco var. menziesii], and sugi [Cryptomeria japonica (Thunberg ex Linnaeus f.) D. Don]. They were compared with COS sets identified in three model plant species using comparative sequence analysis. Almost half of the single-copy genes in herbaceous species (Arabidopsis and rice) had additional copies and homologs in poplar and conifers. The identified tentative COS sets have many applications in evolutionary genomics studies, phylogenetic analysis, and comparative mapping. Supplementary material is available in the online version of this article at http://dx.doi.org/10.1007/s11295-006-0052-2 and is accessible for authorised users. We thank Glenn Howe and Dana Howe (Oregon State University, USA) for providing additional Douglas-fir EST sequences and Stephen DiFazio (West Virginia University, Morgantown, WV, USA) for the poplar predicted protein set. We also thank Santiago C. González-Martínez (Center of Forest Research, Madrid, Spain), Glenn Howe, Jean Bousquet (Université Laval, Canada) and anonymous reviewers for thorough reviewing of the manuscript and useful recommendations that greatly helped us improve the paper. Funding for this project was provided by the USDA Plant Genome National Research Initiative (grant no. 00-35300-9316) and the Pacific Southwest Research Station, the USDA Forest Service within the American Forest & Paper Association Agenda 2020 program. Trade names and commercial products or enterprises are mentioned solely for information and no endorsement by the USDA is implied.